Two fine old inns are within a few minutes' pleasant walk of Old Lyme's famous art institutions. The Old Lyme Inn, 85 Lyme Street, is a mansion dating from the 1850s, with 13 guest rooms, period furnishings and a good dining room. The Bee and Thistle Inn, 100 Lyme Street, dates from colonial times (1756), with many later additions, and 12 guest rooms. Its situation, on its own estate of more than five shady acres bordering the Lieutenant River, is superb. 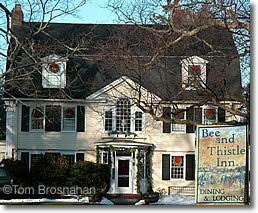 The Bee and Thistle, one of Old Lyme's fine inns.